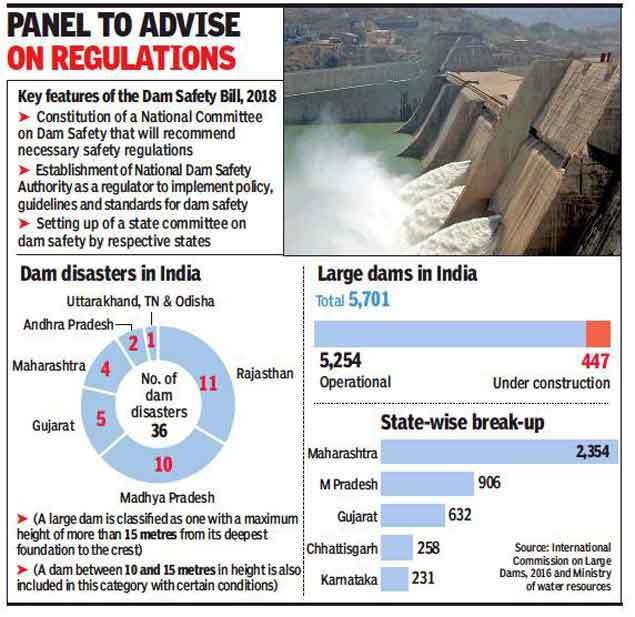 NEW DELHI: The Centre has decided to bring a legislation on dam safety which will empower authorities to take regulatory action and lay down safety standards for existing and new dams in the country. The proposed law lays the onus of dam safety on the dam owner and includes ‘penal provisions’. The draft law — Dam Safety Bill, 2018 — was approved by the Union cabinet on Wednesday. The bill will be introduced in Parliament in the forthcoming monsoon session beginning in July. “It will help all states and Union Territories adopt uniform dam safety procedures. It will ensure safety of dams and help in safeguarding human life, livestock and property,” said an official, referring to the bill’s provisions. The bill provides for mandatory surveillance, emergency action plan, comprehensive dam safety review, inspection and operation & maintenance of all dams in the country to ensure their safe functioning. The bill also provides for setting up a national committee on dam safety which will recommend necessary regulation. Besides, the proposed legislation talks about setting up a National Dam Safety Authority as a central regulatory body which will implement policy, guidelines and standards for dam safety across the country. Lack of legal and institutional architecture for dam safety has long been an issue of concern in India. The country has reported 36 dam disasters, the worst in Gujarat (Machudam in Morbi) where 2,000 people died and 12,700 houses were destroyed in 1979. Construction of Machu dam was completed in 1972 but its flanks were washed away in heavy floods seven years later. Learning from the disasters, the Centre initiated the Dam Rehabilitation and Improvement Project (DRIP-I) in 2012 for strengthening dam safety and operational performance through comprehensive repair and rehabilitation work. It will continue till June 2020.